Burton Cummings was born in Winnipeg, Manitoba. 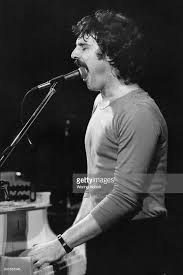 He replaced Chad Allan as lead singer for The Guess Who in 1966. Together with band-mate, Randy Bachman, he wrote These Eyes, Laughing and American Woman. The later was the groups only international #1 record. During Cummings tenure with The Guess Who they would chart 20 singles in the Top 20 in Vancouver. Of these, nine singles were double-sided hits. In 1975 Cummings went solo and began to chart 17 singles on Canada’s RPM 100 singles chart over the next fifteen years. My Own Way to Rock was his second single and title song from his second solo album. The song celebrates an individual marching to the beat of their own drum and having “my own way to rock.” The final verse references the early rock n’ roll era with a nod to Gene Vincent’s “Be-Bop-A-Lula”, the Everly Brothers “Wake Up Little Susie”, Fats Domino’s “I’m In Love Again”, Jerry Lee Lewis’ “Whole Lotta Shakin’ Goin’ On” and Chris Kenner’s 1961 hit, “I Like It Like That”. Burton Cummings is the former lead singer and keyboardist for the Winnipeg, Manitoba, based rock ‘n roll band The Guess Who. He was with the band from 1965 to 1975. Cummings sang, wrote or co-wrote many hit songs. These include “American Woman”, “Clap For The Wolfman”, “Hand Me Down World”, “Laughing”, “No Time”, “Share The Land”, “Star Baby” and “These Eyes”. His solo career includes many hit singles, including “I’m Scared” and “Fine State Of Affairs”. Ini 1976, his first solo hit single, “Stand Tall”, in 1976, became his biggest hit as a solo recording artist. Cummings was born in Winnipeg, Manitoba, in 1947. When he was sixteen he dropped out of high school. In 1962, while only fifteen, Cummings founded a band named the Deverons. All members of the band learned to play by ear. Cummings played piano, saxophone and lead vocals. Their high school dance concerts comprised of covers of songs from the late 50’s and early 60’s including “This Time” by Troy Shondell, “Wild Weekend” by The Rebels, “Sheila” by Tommy Roe and “Only Love Can Break A Heart” by Gene Pitney. The Deverons released a couple of singles and Cummings got some positive word-of-mouth and reviews in the local Winnipeg papers. This was pretty exciting for bandmates who still all lived in their parents homes. In January 1966 Cummings was asked to join another Winnipeg band, The Guess Who, when keyboardist Bob Ashley left the group. By May 1966 Burton Cummings became the lead vocal for the group when Chad Allen left to pursue solo work and host the CBC TV show Let’s Go. While Cummings was with The Guess Who the band scored twenty-one Top 20 hits in Canada, including five number one singles on the Canadian RPM record charts: “Shakin’ All Over”, “Laughing”, “No Time” and “American Woman”/”No Sugar Tonight”. In 1975, Cummings began a solo career after The Guess Who disbanded. That year, Cummings began a solo career after The Guess Who disbanded. That year he added backing vocals for Eric Carmen’s track, “Marathon Man”, from his Boats Against The Current album. Burton’s first two albums went double-platinum. 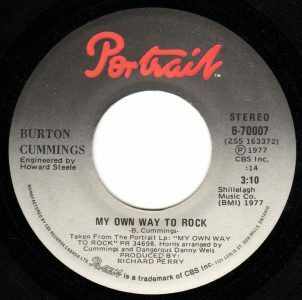 The title track from his second album, My Own Way To Rock, became a Top 20 hit in Vancouver. “My Own Way To Rock” climbed to #13 in Vancouver, #16 in Toronto and #24 in Ottawa. This is a song about how playing a jukebox can make a difference in your life. At the songs’ conclusion, Burton Cummings references a number of songs he knows how to play in a jukebox after he has put in his quarters. They’re examples of how he keeps on rockin’ after his “baby” has gone and left him. He can play “Be Bop A Lula” by Gene Vincent, “Wake Up Little Susie” by the Everly Brothers, “I’m In Love Again” by Fats Domino and “Whole Lotta Shakin’ Goin’ On” by Jerry Lee Lewis. These songs were variously hits between 1956 and 1957. The breakup isn’t going to break his stride. He’s likely got a whole roster of songs he can play and tap his toes, dance to and sing along to. Music makes him find a way to keep rolling. It nurtures his soul. In 1889 the first coin-operated music machine was introduced in San Francisco at the Royale Palais Saloon. Since there was no amplifier, those paying to hear a song had to use a listening tube, placing it against their ear. In 1906 at the Pan-Pacific Exposition, there was an Automatic Entertainer featuring a forty inch horn on top of the cabinet. The only problem was the amplifier had little volume. This prevented patrons in saloons from being able to hear the records once there were many people in the room. In 1918, Hobart C. Niblack invented a mechanism that allowed records to be changed in a music box. In 1925, the 78 RPM was introduced into the market and jukeboxes emerged that could play 78 RPM discs. In 1927, this became marketed as a jukebox by the Automated Musical Instrument Company. In 1928, Justus P. Seeburg marketed a music system that featured an electrostatic loudspeaker with a record player that was coin- operated. Patrons could select from a choice of eight discs. Often radio recorded live performances from upscale lounges and hotel ballrooms. Listening to a record on a jukebox was the only other way to hear the song before deciding to purchase a copy. During the Great Depression, record companies depended on sales of records to play on jukeboxes to salvage a shrinking market when individual record buyers opted to not shell out for personal record collecting. In addition to Seeburg, there were jukeboxes marketed by the Rock-Ola Manufacturing Company, Wurlitzer and Automatic Musical Instruments Co. The golden era of jukebox music was in the 1940s to 1960s. The 45 RPM was introduced in 1950 and helped increase the number of discs that could be played in a jukebox. However, the invention of the portable radio in the 1950’s, and the cassette player in the 1960’s, contributed to the decline of usage of jukeboxes in cafes, soda shops and other gathering places. Cummings’ next single to hit the Vancouver pop charts was in the winter of 1977-78. It was a single from his self-titled album called “Your Back Yard“. His third album, Dream Of A Child, went triple-platinum. It included two Top Ten singles in Canada: “I Will Play A Rhapsody”, and the debut single, “Break It To Them Gently”. The album, Dream Of A Child, earned Burton Cummings a Juno Award in 1979 for Top Selling Album. In 1980 Burton Cummings had a Top 20 hit in Vancouver titled “Mile A Second“. Cummings has lived in both California and Winnipeg. Among the many highlights of Burton Cummings career, in the 1980’s and 1990’s he toured with Ringo Starr’s All Starr Band. Cummings also starred in the 1982 feature film, Melanie, and won a Genie Award for Best Original Song in 1983. The Guess Who have toured from time to time on reunion tours since 2000. Burton Cummings has performed in concert with the Bachman-Cummings Band and also gone on tour as a solo act. In 2009, Cummings received the Order of Canada. More recently, he published a book of poetry titled The Writings off B.L. Cummings. As of April 24, 2018, Burton Cummings has six concert dates scheduled between June and August, 2018, across British Columbia, Saskatchewan, Manitoba and Ontario. With fifty albums recorded, he shows no sign to slowing down in his seventh decade. In 2009 Cummings received the Order of Canada, given to individuals who have made an outstanding achievement and service to the Canadian nation. There is also a theatre named after Cummings in Winnipeg. Cummings, Burton. The Writings of B.L. Cummings. Rock Paper Merchandise.com, 2017. Burton Cummings – Bio, Burton Cummings.com. The Deverons, Manitoba Music Museum.com. Mary Bellis, History of the Jukebox, Thoughtco.com. Gert J. Almind, History of the Jukebox, Radio Museum.org.